Announcing classes for the new year! 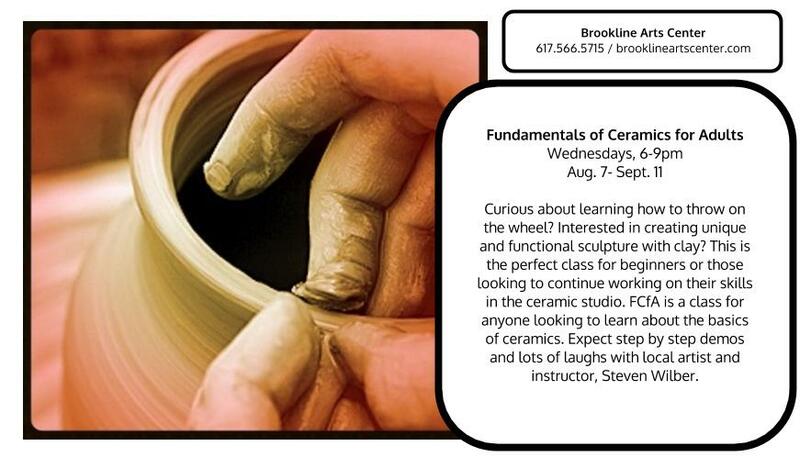 Adult ceramic classes for Boston! The pièce de résistance of “Force for Good” ready to be attached. For the last several months I’ve been working with ten teen artists (and their friends) to create an installation that speaks out against racism in conjunction with the Culture for Change program of Boston. The group and I are finally ready to present our nearly 24′ piece to the public tomorrow evening. What follows is our artists statement. For more on the process, please check out the YES for Change Tumblr page. papier-mâché (head), clear tape & saran wrap (spine), wooden frames (body), sequined fabric (skin), mirrors, and other medium. Being given the opportunity to create some sort of artwork that educates the cause and effect of racism is both exciting and a little daunting. The subject of racism is very broad, as were our choices of art to use to translate our message. Following the process of an artist, starting with an idea, continuing with research, practicing with trial and error team building projects, and finally execution, we arrived at what stands before you. During the course of the year we researched a variety of issues and events related to racism and in particular our community of Chinatown. We also sought out to learn more about the broad medium of installation art, knowing we did not want to necessarily produce standard 2D artwork. We learned about the Chinese Exclusion Act of 1882, one of the most significant restrictions on free immigration in the US. Our investigation of racism and installation art brought us all over Boston and beyond. Our group visited the Chinatown Library where we viewed an Atlas timeline of Chinatown. It was a way for us to learn and find our roots and to see how it was like for our grandparents and great grandparents to deal with the obstacles presented to them in a new country. We visited the ICA to view installation art and hopefully inspire us. We learned about Ai Wei Wei and how he used installation art to oppose the Chinese communist government. Another famous installation artist, Yayoi Kasuma, taught us that much of installation art is conceptual, meaning that the artist’s ideas or concept are more important that the actual beauty of the piece. Our team combined ideas collected from months worth of projects and field trips and drafted a final form for our installation. What we present to the community is a Chinese inspired dragon, its spine built of interlocking lit hands, surrounding a plastic figure and several mirrors. The mirrors reflect our audiences’ faces and positive phrases allowing viewers to become a part of the piece. The encircled separated plastic figure amid the sea of reflections is used to show the effects of racism, something, at one point, everyone has encountered, making us feel isolated or less than a whole. The dragon represents our main message, coming together we become an unstoppable force against racism. We are equally proud of our final piece and of all the work our team has done. This installation is our reward to show everyone what we’ve learned about art, racism, our culture, and each other. Here is an article from the New York Times further discussing the NH law I brought up in my previous post. 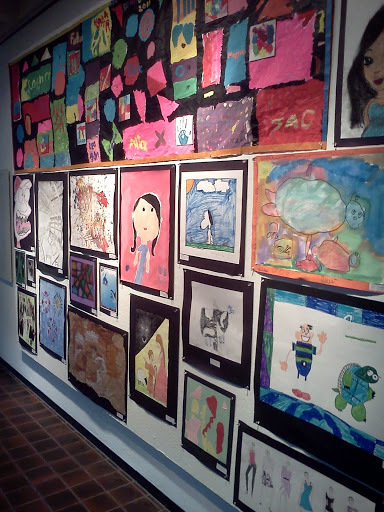 The Youth Summer Student Art Show opens today at the Worcester Art Museum and runs till October 11th — check it out! What inspires an eight year old? Summer classes at the Worcester Art Museum fly by so fast I often don’t have time to study what students have produced for their final projects. That is, until I prepare for the museum’s special end of summer youth art show. We especially had fun during a five day, “Express Yourself” class. 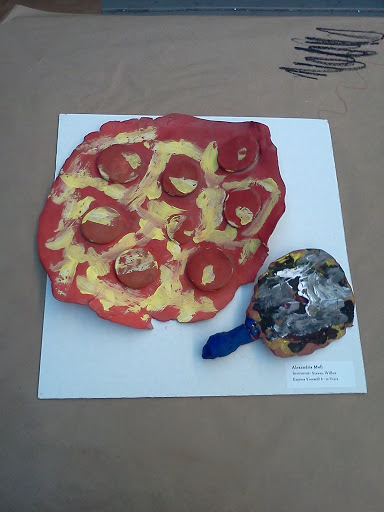 This was a project in which I conducted a formal art lesson for one hour and a second hour was given to students to develop their own art piece in whatever medium they chose. The theme of the piece had to be a reflection of what inspires them to do art. Everyone produced different answers, from nature, shapes, to fairy tales, and food. 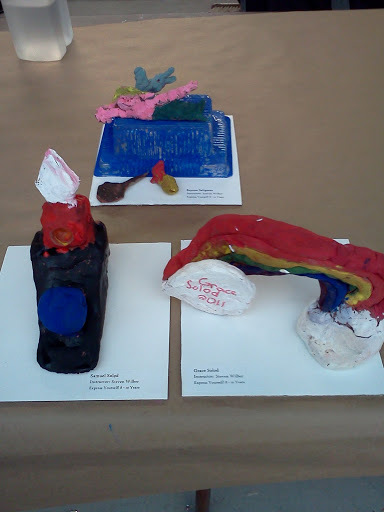 I am incredibly pleased with the paintings, sculptures, and poems that were created and presented last Friday. 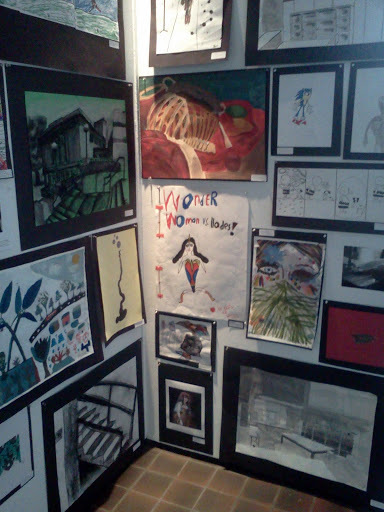 The student art show opens September 21st.